Beloved husband, father, and grandfather, Carl Richard Jennings passed away suddenly on Friday, June 8, 2018 in Mount Pleasant, Wisconsin. Carl was born January 24, 1953 in San Francisco, California to Holden ‘Red’ Jennings and Jewel Dean Monks-Jennings. While Carl was small, the family moved to Eufaula, Oklahoma. 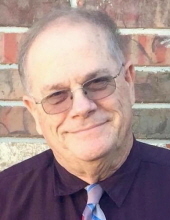 Carl grew up in Eufaula, and graduated as a proud Eufaula Ironhead, Class of 1971. Shortly after graduation, Carl found the love of his life and very smartly married her. Carl was joined to Danna Carroll on March 13, 1972 in a wedding ceremony held in his parents’ living room. Their union would last the rest of his life, 46 years, and produce two sons and four grandchildren. Carl served 23 years in the U.S. Army, retiring as a First Sergeant. Danna served beside him, moving the family many times, including being stationed in Germany 10 years. Carl loved Germany, especially the food and beer. After retiring from the Army, Carl started driving professionally and owned his own trucking business. He would drive for the next 24 years. Carl enjoyed all things high-tech and loved talking about computers. Carl loved to talk, and everyone has memories of long talks with him. No matter if it was politics, O.U. Sooners football, new technology, cars, or his grandkids; Carl was always ready to talk about it. Often offering unsolicited advice, but we loved him anyways. He had a fondness for Hallmark movies, often recording them for “DanDan”, and then watching them later with the granddaughters. He was a real marshmallow for his girls.Time with his family was what Carl loved most. And he always made sure some of his grandchildren were with him whenever he was at home. His job kept him away from home often, but somehow he would make it home for holidays, special occasions, and big football games. Carl was most proud of his family and leaves behind many loved ones. In lieu of flowers, Carl's family has asked that donations be made, in his honor, to the American Legion, Post 353, Mustang, OK. He is survived by his wife Danna, two sons, Richard and wife Jada, and Tony and wife Alaina, and four beautiful granddaughters, Caitie, Kysa, Brielle and Eralyn. Also surviving are six brothers, Bruce and wife Dottie of Cashion, OK., Jeff and wife DaNel of Eufaula, OK., Bobby and wife Diana of Springdale, AR., James of Eufaula, OK., Howard Bryan of LaSalle, IL. , and David of Okmulgee, OK., and a host of nieces and nephews and extended family. He is preceded in death by his parents, and older sisters, Linda and Edith. Services will be held Thursday, June 14 at 10 a.m., at the First Baptist Church of Piedmont OK. Followed by 2 p.m. interment at Fort Sill National Cemetery, Elgin OK., with full military honors. To send flowers or a remembrance gift to the family of Carl Richard Jennings, please visit our Tribute Store. 2648 NE Jake Dunn Rd. "Email Address" would like to share the life celebration of Carl Richard Jennings. Click on the "link" to go to share a favorite memory or leave a condolence message for the family.